This pattern is meant to make a reversible hat with 2 colors. If using only one color, simply ignore color changes. Round 1: Color A [K1, bring yarn forward, slip next stitch purlwise, bring yarn back]. Repeat from […] until end of round. Round 2: Color B [slip next stitch purlwise, bring yarn forward, P1, bring yarn back]. Repeat from […] until end of round. Round 3 – 80: Repeat Rounds 1-2 for 39 more times. Or until hat measure 6.5 inches tall. Make sure to end on Round 2. Decrease Round 1: Color A: *[K1, bring yarn forward, slip 1, bring yarn back] 7 times, slip next stitch (color A) purlwise, place next stitch (color B) on cable needle and hold at back, place first stitch back on left needle and knit it together with next stitch (both stitches should be color A), bring yarn to front, place color B stitch back from cable needle onto left needle, slip both color B stitches purlwise, bring yarn back*. Repeat from * to * until end of round. Decrease Round 3: Repeat Round 1 (of original pattern). Decrease Round 4: Repeat Round 2 (of original pattern). Decrease Round 5: Repeat Decrease Round 1 but substitute “7 times” for “6 times”. Decrease Round 7-8: Repeat Round 1-2 (of original pattern). Decrease Round 11-12: Repeat Round 1-2 (of original pattern). Decrease Round 15-16: Repeat Round 1-2 (of original pattern). Decrease Round 19-20: Repeat Round 1-2 (of original pattern). Cut yarn ends leaving 8″ tail. Thread each yarn end onto tapestry needle and through like-colored stitches. Cinch yarn end to close the top of each side of the hat. Weave ends in on each side by following the path of the stitches (like duplicate stitch) so they are not visible. Make oversized pompom. Approx. 3 inches wide. Make sure to leave ample tail for attaching. Attach pompom. *Add a Ribbed Brim to the hat if you like by following my instructions here. I wanted a good fat puffy GIANT POMPOM! I also wanted to make make sure it was about 2.5 to 3 inches wide. But i didnt want to spend money or buy extra junk like a pompom maker, so I came up with an easy way to make a pompom template. All you need is some scrap cardboard, scissors, a mug and a quarter or an old CD to use as stencils. Make 2 rings (like a donut shape), cut a slit through the rings making the donut shape into a C-shape. Widen the slit by trimming some more off the ends so it’s easy to pass the yarn through. Take yarn, wrap around the C-shape as if you’re trying to make a yarn covered “C”. No need for needles or pre-cutting yarn. Just slip yarn through the slit to wrap. This way there’s no wasted yarn, the working end of the yarn is coming straight from the ball and you’ll never run out. To make sure the pompom comes out the size needed: e.g. If you need a 3 inch pompom, the rings have to be about 1.5 inches thick (plus a little extra for trimming). When full enough, snip edges, pull yarn tail through, cinch, and tie. Fluff and trim making sure to not trim off yarn tail. You’ll need that to attach the pompom. 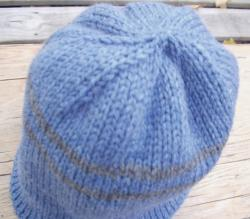 This hat is knitted in Double Knit meaning you will be knitting a hat with 2 layers. It’s a technique that allows you to knit 2 sides at the same time giving you a reversible hat. Each time you purl a round, you are basically knitting the inside of the hat! Double Knitting gives your piece more body and less drape. As you can see, the hat can stand up on its own and hold its shape. It also makes the piece extra warm! Main body of hat before decreases is about 6.5 inches high. Decrease portion of hat is about 2.25 inches high. 1 full ball makes about 6 inches or a total of 70 rounds (35 front, 35 back). So about 1 full ball is almost enough for the main body of the hat (before beginning the decreases). This hat is knitted in the round or circular knitting from the brim up to the crown. So no turning of your work required. Just join the first and last stitch from Round 1 and continue knitting as normal in circular knitting. Make sure to place stitch marker onto needle before joining (After Round 1 and before Round 2). The 2 pics on the left are what I was going for. It didn’t come out exactly as I wanted. I wanted the hat a little taller. Instead I got more of a South Park Cartman or Stan look… Oh well. Next time I would add about 2 more inches to the height of the hat (about 20 more rows…) and decrease the stitches to about 144. Perhaps a ribbed brim too. I also want to try adapting the pattern for DK Weight yarn for a more elegant look. 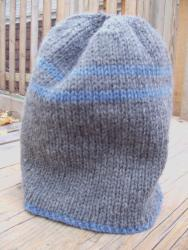 Original pattern, Double Knit Ski Hat, adapted from Blue Blog Patterns by Alison Hansel. Her knit hat is two colors, with stripes, and reversible! This pattern is written for a 2 color hat. Simply ignore “Color A” and “Color B” by using the same color if doing a single color hat like I did. No need to switch yarns.